"On March 12, 2018, I sued Michael Ovitz in federal court in Washington, D.C. for breach of contract. For the past year, I have remained silent as the lawyers in the case exchanged legal briefs for this litigation, including Mr. Ovitz's motion to dismiss. . . . Today, a U.S. District Judge, the Honorable Christopher R. Cooper, denied Mr. Ovitz's motion to dismiss on all points, allowing this lawsuit to proceed. "God bless my wonderful attorneys, Roger Simmons and Susan Eisner at Gordon & Simmons in Frederick, Maryland. "Here is Judge Cooper's well-written decision which also lays out the facts of the case. In his opening sentence, Judge Cooper wrote, 'This case is the contractual companion to a classic film noir tale of revenge, shifting alliances, and relationships gone bad.'" * Also, here is the court docket in this litigation for Moldea v. Ovitz, including our original complaint. Busch v. Ovitz was settled on January 29, 2018 . . .
To understand how I got dragged into Busch v. Ovitz/Pellicano, et al. out of pure self-defense, please read my 11-09-2011 sworn declaration--which was executed in the State of Maryland and is among the four updates listed below. A trial to decide the statute of limitations issues began on September 24, 2013, at the Los Angeles County Superior Court (Central Civil West Courthouse) at 600 S. Commonwealth Avenue. Trial testimony ended on October 22. The judge presiding in this case is The Honorable Elihu M. Berle. Anita Busch took the stand on September 24-25, as well as on October 11 and 22. Dave Robb testified under oath on October 2 and 11. I appeared for sworn testimony on September 25 and 27. The courtroom became the latest venue for what is now Anita and Dave's nine-year smear campaign against me. I am willing to submit my sworn testimony to the Los Angeles District Attorney's Office and pledge my full cooperation--as well as full disclosure--to any subsequent investigation as to who testified honestly under oath and who did not during the trial. I challenge Anita Busch and Dave Robb--who have repeatedly made provably false statements about me, even under oath--to make that same offer. Below is my response to the recent sworn declaration executed by John Connolly, in which I document the false statements made by Connolly, as well as additional false statements by Anita Busch. To be clear, our joint belief about [Michael] Ovitz’s role was primarily based on information that Anita had received from the FBI. . . . Briefly, on June 12, 2003, Anita learned from FBI Special Agent Tom Ballard that a police-computer file about her had been run on May 16, 2002, by an LAPD detective who was working with Pellicano. The May 16 date was over two weeks before Anita joined the Los Angeles Times where she began her reporting on Steven Seagal and Jules Nasso. However, it was just nine days after she had completed her seven-part series about Ovitz in the New York Times where she worked with staff reporter Bernard Weinraub. Significantly—throughout her four depositions under oath and her sworn declaration of January 10, 2013—Anita flatly denied ever believing as early as June 2003 that Ovitz was involved, contrary to what appeared in her personal notes and in our draft manuscript. Just to be clear: Under the terms of our collaboration contract, Anita had full editorial control of our manuscript—which was based on her own personal notes—and she exercised that right at every given opportunity. Everything is in writing. Below is my response to the recent sworn declaration executed by Dave Robb, which goes, in part, to the core of Anita's latest and most disingenuous line of attack against me. Like all of the others, this one lacks any sense of fairness, honesty, or integrity. Significantly, Anita never made any such claim during her sworn testimony at Anthony Pellicano’s federal conspiracy trial or during any of her four depositions under oath in her civil case. In the midst of those venues—in which our book project was discussed at length—she provided other conflicting and equally false explanations. . . . In summary: After Anita had unilaterally stopped our two-year book project because it interfered with her civil case and then refused to speak with me because I had the audacity to complain about it—and then told me to go through Dave Robb if I had anything to say to her—this was the actual and true reason that our collaboration “broke down.” . . . The latest strategy by Anita and her team—which includes the phony claims by Dave Robb in his sworn declaration—to resurrect the charge that I betrayed Anita by concealing my connection to Jules Nasso is completely and totally false, disproven by the written record of this sad situation. 3. In May 2003, I began writing a nonfiction book with Anita Busch (“Ms. Busch”) in the wake of the alleged attacks against her by Anthony Pellicano (“Mr. Pellicano”), hoping that we could get the book published, tell her important story, and make money on the back end. 4. Ms. Busch and I signed an Author Collaboration Agreement (“Collaboration Agreement”) in January 2004. Although we would share the copyright and she would have editorial control, I would be the sole author. We gave the book the working title, A Woman at Risk (the “Book”). In addition, we originally agreed that we would split all advances and royalties 60-40 in her favor. I would work for free on this project and receive no money until we sold our Book project to a publishing house. A true and accurate copy of this Collaboration Agreement is attached hereto as Exhibit A. 5. To assist in the composition of the draft proposals and draft manuscripts, Ms. Busch faxed and mailed to me no fewer than170 single-spaced pages of detailed personal notes about how her life and career had been affected by the Pellicano investigation. These notes served as the foundation for our Book. 6. Between June 2004 and May 2005, I sent Ms. Busch four (4) clean and unmarked draft manuscripts, dated June 19, 2004, April 11, 2005, May 3, 2005, and May 10, 2005. 7. Ms. Busch provided handwritten edits for the first three (3) draft manuscripts, along with some typewritten material. However, she refused to approve the May 10, 2005, draft manuscript until I made a single change on page 230, which is the only difference between the May 10 and the final May 11, 2005, versions. 9. On May 25, 2005, Ms. Busch unilaterally halted our Book project because it supposedly conflicted with and jeopardized her civil lawsuit. She told me that her attorneys complained that our Book provided too much “free information” to the defense in her case. 10. I vigorously objected to her decision, provoking Ms. Busch to launch a smear campaign against me which continues to this day. 11. During her sworn testimony at Mr. Pellicano’s criminal trial on April 9, 2008, Ms. Busch falsely claimed that she ended her collaboration with me because I had “used” her, a charge that was reported the following day in the New York Times. 12. On the same day as the New York Times article appeared, I responded to Ms. Busch’s allegations on my personal website: https://www.moldea.com/Busch-response.html. 13. On August 18, 2011, I received a subpoena at my home from the lawyers for Michael Ovitz (“Mr. Ovitz”), a defendant in Ms. Busch’s civil case. I immediately called my attorney, Roger C. Simmons, and asked him to fight it. He and his associate, Jodi Lynn Foss, quickly notified Mr. Ovitz’s lawyers that we were willing to go to court to quash the subpoena. 14. In the days that followed, the subpoena was withdrawn. However, Mr. Ovitz’s attorneys sent us several non-privileged documents from the case. We refused to sign a required protective order for additional privileged materials. The non-privileged documents we did receive included Ms. Busch’s sworn depositions of April 14, July 21, and August 3, 2011. 15. I was shocked to see that Ms. Busch had provided my personal and private communications—as well as our draft proposals and the last draft manuscript of May 11, 2005—to the defense in her case without notifying me or my attorneys, even though I continue to own at least a forty-percent stake in this literary property. 16. Then, after reading Ms. Busch’s sworn testimony—which was replete with false statements about me—I decided that I had no choice but to defend myself and to respond to her allegations, point by point. I do so in this Declaration. "Anita is not telling the truth about me and the fate of our book project. 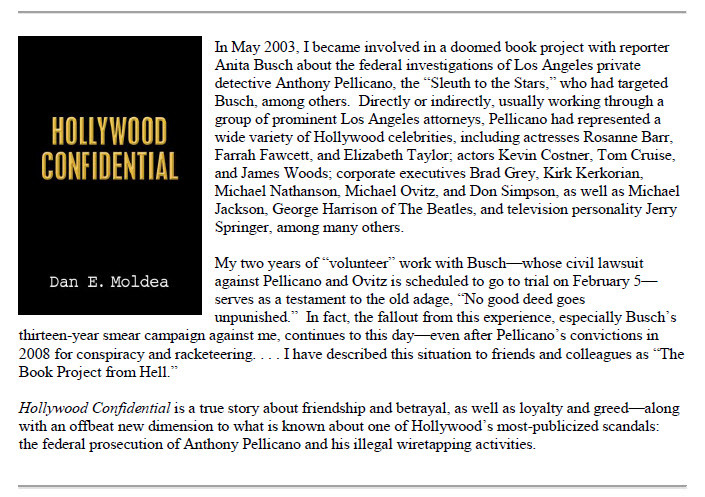 In the midst of her civil case against Anthony Pellicano and his co-defendants--for which she stands to make a tremendous amount of money--she decided, in writing, to sacrifice our book, which her attorneys supposedly feared would give too much "free information" to the defense. Then, when I complained, she launched a smear campaign against me, which continues to this day." As per my attorney's instructions, I have had no verbal or written communications with Anita since her last email to me on February 9, 2006. A lawyer for one of Mr. Pellicano’s co-defendants pressed Ms. Busch about a memoir she said she had begun with two other writers, Dan Moldea and John Connolly. She said at first she had thought it could be a way “to survive financially.” But she said she had concluded that she was being used and abandoned it. “There will never be a book,” she said. For the record, I never "used" Anita Busch for any purpose. During the time that we worked together, I was always a loyal friend and colleague.